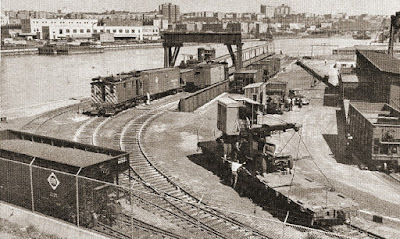 A lingering mystery about Harlem Station is the coal shed that used to stand near the loading ramp. This narrow and long structure would be quite easy to model, but photographic and graphical evidences clashes. The thawing coal shed can be seen on the right side. According to some maps (in fact, most of them), the coal shed – often identified by railfans as a thawing coal shed – was built on top of a track. It would mean coal hoppers we pushed under the structure. Photographs also show there was indeed two tracks leading to the ramps thought only one is visible on the Harlem River side of the shed. My biggest concern is about the shed itself. If a track was under it, how the building structure was made. The pictures let me believe there was some kind of raised floor on each sides of the track, but it would make little sense to have one.... How would such a building be put in use? Feel free to comment with your favorite theory, or to clarify my understanding of that neat structure in Harlem. I’m pretty sure someone got some knowledge of similar coal shed covering a track. Edit: While information abound about modern thawing sheds, older ones are less documented. According to several sources, the heating process was done by torching or with steam pipes. We can already exclude the later since Harlem Station didn't had any sizeable boiler room that could have supplied enough steam (except if something comes up). 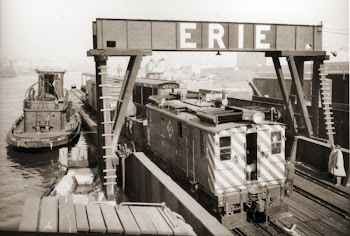 By the way, as I’m planning to develop the operation concept for the layout, I’m searching for customers that used to be served by Erie’s Harlem Station back in the 1950s, more exactly in 1952. I already have on hand a list of names, but except for a few obvious ones in pictures (Gassman Coal, Jerome Fuel), but others are harder to locate since they didn’t have billboard on the property. Among them are, tentatively, Mirandi Coal (? ), Victory Coal, Consumer’s Coal, Bay Transportation, National Carloading, Eastern Trucking and a company dealing with construction equipment (cranes in particular). Any glimpse of information would be appreciated. I have no knowledge about Erie’s archives, but under normal circumstances, papers and scale drawings of the property should survive with indications about tenants and their location.